Taken at Dry Sandford Pit, Oxon., on August 6th 2017. Taken at Lardon Chase, Berks, on August 2nd 2018. Larva. Taken in the Vercors NP, France, on July 21st 2018. 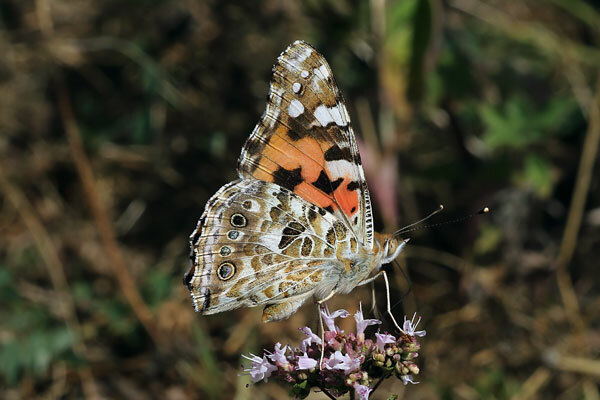 The Painted Lady is a migrant to the British Isles; none of its stages are able to over-winter successfully here. It originates from north Africa, and the urge to migrate may be triggered when an individual encounters a certain density of its own kind within a given area. The 2009 migration is considered to be one of the greatest ever, with as many as 11 million insects arriving during the weekend of 23/24 May alone. Painted Ladies can be seen anywhere in the British Isles. They can be found in any type of habitat. Adults usually start arriving in late March and continue into May and June. These breed and give rise to the next generation that peaks between mid-August and early October. There may be more than one brood, depending largely on the weather. There may also be furthur waves of immigrants later in the summer. 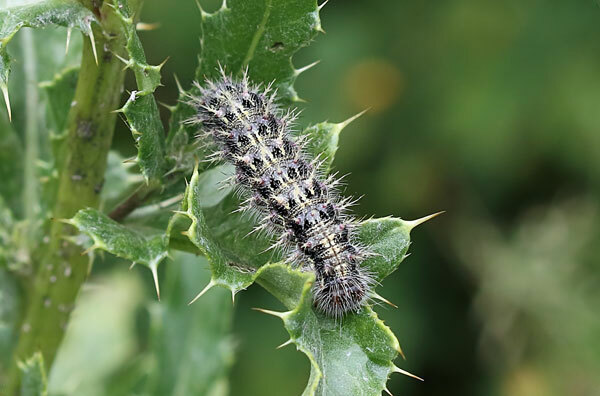 The main larval foodplant is Thistle. Common Nettle, Mallow and Viper's Bugloss are also used, although in much smaller numbers. Thistles and Teasel are favourite nectar sources for adults. 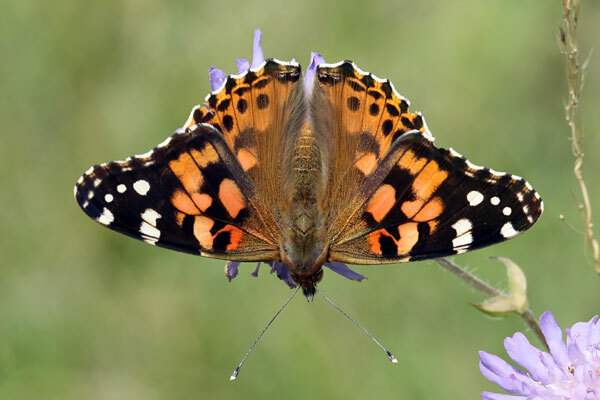 In 2009 it was proved that Painted Ladies make the reverse migration from the UK back to North Africa in the autumn. It appears that more insects return to North Africa than arrived to breed the previous spring.